The book of Proverbs is full of delightful wisdoms. Whenever you need uplifting, or a word of wisdom, there is always something there to guide you. Proverbs 12:4 A wife of noble character is her husband’s crown, but a disgraceful wife is like decay in his bones. This verse highlights the importance of the role of a wife in the family. Today, a “virtuous man” may also be hard to find. Many men have abandoned their families, and often fail to provide for all their children, both financial and in terms of time. They are not at home to show young men and boys how a wife should be treated, cared for and loved. It is sad that so many women are left to fend for themselves and their families because of selfish men. 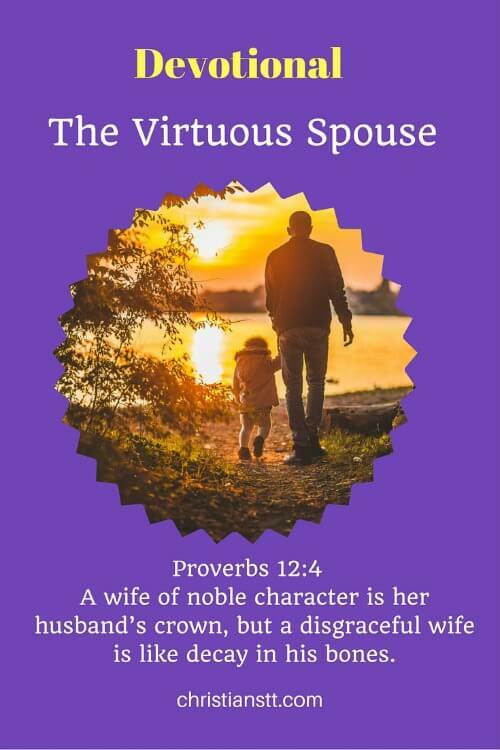 If you are a WOMAN, ask God to grant you the wisdom to be a virtuous wife and mother, a mother that your children would be proud of and that your daughters will look up to. When you do get angry, be quiet, and speak to the Lord. Ask His help in your situation, so that the words you speak will bring healing and wisdom. If you are a MAN, be strong for your family. Love your wife, be committed, study the Word to show yourself approved. Spend quality time with your family and let them know that you want to be there for them. Yes, it does require some sacrifices. It means missing that sports game, or that lime with your friends. But being a real true “Dad” is the honorable gift you can give. Don’t be just a father, be a DAD! Dismayed, feeling unappreciated? It’s time to overcome! WOW, WOW, WOW. AND THANKS SO MUCH FOR A WORD IN SPEAKING TO US AS MEN AND WOMEN IN TAKING OUR PLACE IN OUR HOME. WE PRAY THE BLESSING OF US TO TAKE HEED TOT HE WORD OF GOD IN JESUS NAME! BLESS THE SENDER OF THIS WORD LORD!